Well, for my 4th of July I drove 4 hours to Kansas City to see Yes in concert at the Sandstone Ampitheater. I got there a couple of hours early and was able to hear the sound check (The Calling) from where I was in the parking lot. They finally opened the gates at 6:30. The weather was clear, but very hot. The band didn't come out until the sun had just dipped below the horizon - otherwise it would have been in their faces. Including the intermission, the band played for almost exactly three hours, from 8:20 to 11:20. The set list is somewhat surprising because there is only one song from Big Generator and NONE from Union. I was very much hoping to hear Shoot High Aim Low, Lift Me Up, and especially The More We Live - Let Go or even Say Goodbye. Oh well,...here's hoping they get around to playing some of these later in the tour. The show was extremely LOUD. The bass system seemed to be turned up too much, but I was sitting pretty close to the speakers though. At times the low end seemed to drown out everything else, and I had to strain to hear all the vocals during the loudest sections. My ears are still ringing a bit. No complaints about the light show. It was excellent, especially during Changes and Heart Of The Sunrise in the first set, and all the way through the second set. The crowd where I was (down front) was VERY much into the show, standing and cheering like mad after each song. 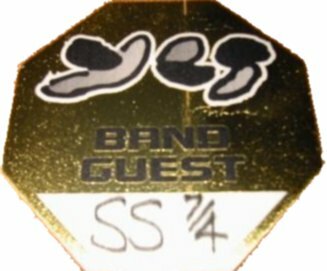 Most didn't seem to be that familiar with the Talk material, it was mostly the 90125 material that got the most respone, although Endless Dream went over incredibly well, impressing even the older Yes fans who were sitting next to me. If the band wasn't enjoying themselves, I don't think they would have added Hold On to the encore. The group was very tight, and Rabin wasn't anywhere near as flashy as I thought he was going to be (as others have noted). For the most part Billy Sherwood played background chords on acoustic guitar, and stayed up around Alan or on one of the ramps. For I've Seen All Good People and Endless Dream he came down to the front near Squire. For the Silent Spring section of Endless Dream he played bass with Squire! He did some backing vocals, but not as much as I thought he would. Anderson, when not doing lead vocals, would play keyboards and percussion up above and behind Kaye. 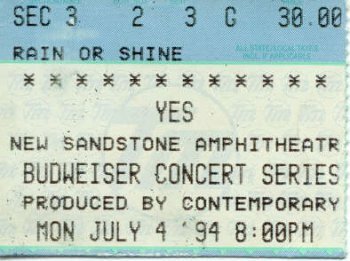 I saw Yes last night (July 4) at the Sandstone Amphitheater--an outdoor venue near Kansas City. The stars were out, the humidity was low, and the breeze was great. The _Talk_ material was very true to the LP--not too much in the way of jamming, etc. The old songs were limited to "Heart of the Sunrise" (in which Chris did tease us by delaying the bass beats now and again), "And You and I," "I've Seen All Good People," and "Roundabout." The _90125/BG_ songs were "Owner of a Lonely Heart," "Hearts," "Hold On," "Cinema," "Rhythm of Love," "City of Love." I'm probably forgetting one or two more. Yes' instrumental performance throughout the show was rather bland, except during a rather inspired, energetic version of "I've Seen All Good People," which Jon started acoustically. It could, often, just as easily have been _Whitesnake_ or some other glam-metal band playing on stage as _Yes_, given the cheesy, fake-metal guitar work of Trevor, the mostly non-existent keyboarding by Tony, and the rote-like drumming by Alan. Jon sang fine, and even waxed a little airy as he babbled about the moths attracted to the stage lights holding the "dust of knowledge on their wings" or somesuch :-) Chris' playing was nicely foregrounded, but also contributed to the heavy metal sound of the performance--no subtleties here either. They just didn't seem into it. Part of that may have been that the crowd didn't seem all that into it either, and that the fans seemed to be more casual, newer fans (the band got the most response from _90125_ material). It certainly was different than the crowds I've seen Yes with before, in Philly. I hope your experiences were better than mine, that it was an off night. Call it techno-rock on overdrive. Whatever label you apply to the music of Yes, it's bound to fall short of describing the innovative sounds emanating from the Sandstone Amphitheater stage Monday night. A somewhat sparse but appreciative crowd welcomed veteran Yes men Trevor Rabin and Chris Squire, but it was wraithlike front man Jon Anderson who got the star treatment. Swathed in a gauzy white tunic tied with an African rint sash, Anderson made a dramatic entrance as he descended a metallic ramp at center stage to open the show with The Calling from the group's current Talk album. The danger with the veteran band's distinctive brand of synthesizer-laden rock is that it tends to sound manufactured rather than composed. In its most tedious moments, the music is just so much Macintosh-enhanced navel gazing. What salvages much of the work is the extraordinary musicianship of its members. Rabin is a keyboard wizard as well as an accomplished guitarist, as his Jimi Hendrix-style Star Spangled Banner proved at the opening of the concert's second half. Add to the mix Squire's feverish bass line, some impressive keyboard work from Tony Kaye and a solid backbeat from percussionist Alan White, and the result is an overpowering wall of sound. Virtually the entire Talk album was included in the Sandstone performance, which ranges from the gentle, African-influenced percussive beat of I Am Waiting to the relentlessly discordant Real Love. Although it is varied in its musical influences, Talk projects a theme that questions the divisive forces separating human beings. 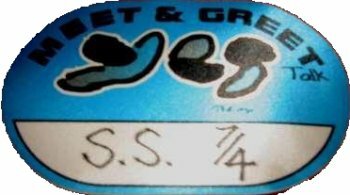 Yes is primarily an aural experience but songs such as the fist-pumping classic Owner of a Lonely Heart have a certain primal power that remains uncompromised by lyrical inadequacies. The evening's most impressive display of musicianship was a beautifully executed suite of songs titled Endless Dream. The piece acquired the force of an anthem. From Rabin's instrumental prologue through Anderson's choirlike vocal, Yes was at its most powerful.